Fusion is the energy source of the Sun and all of the stars in the universe. In nuclear fusion, the nuclei (protons and neutrons) of two atoms are forced together to form a heavier nucleus. In fission you remember, the nucleus of an atom is split in two making two lighter isotopes. In order for nuclear fusion to occur, the nuclei must be brought close together so that the nuclear force of attraction between the protons and neutrons overcomes the electric force of repulsion of the protons. Since the nuclear force acts only over small distances, it requires considerable energy to do this. For this reason, fusion occurs mostly in high temperature environments, where the particles are close together and fast moving. When smaller atoms, such as hydrogen and helium, are fused, more energy is released than is required. Larger atoms (larger than iron) generally do not fuse because they are less stable than iron. 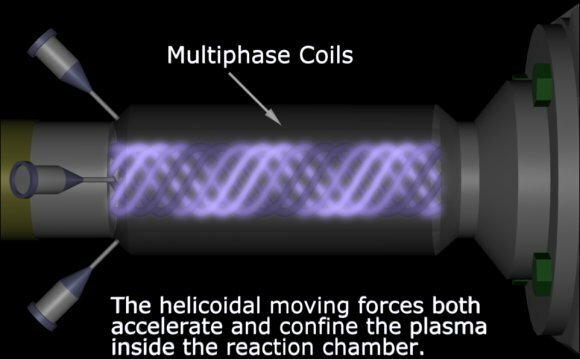 The fusion process shown in the animation involves deuterium (hydrogen-2) and tritium (hydrogen-3) fusing to give helium and a neutron which is ejected from the atom at a high speed. The energy released in this reaction goes into the kinetic energy of the helium and the neutron. Fusion occurs in a star because the massive gravity of the star creates pressures so intense light elements such hydrogen are fused together to make deuterium. In this process, a positron and a neutrino are released (due to the conversion of a proton into a neutron). Fusion can also be achieved using extreme temperatures which also occur in stars. All life on Earth is dependant on nuclear fusion. It is the energy source that warms our planet and gives us light. Here on Earth scientists have only been able to achieve fusion reactions lasting a few seconds but around the world there has been research into using nuclear fusion as an energy source. If successful, nuclear fusion could possibly result in a limitless supply of clean energy. Two protons combine to form a deuterium (hydrogen atom with one neutron), a positron (similar to electron, but with a positive charge) and a neutrino. Two helium-3 atoms combine to form a helium-4 (two protons and two neutrons) and two protons. A helium-3 and a helium-4 combine to form a beryllium-7 (four protons and three neutrons) and a gamma ray. A beryllium-7 captures an electron to become lithium-7 (three protons and four neutrons) and a neutrino. The helium-4 atoms are less massive than the four hydrogen atoms that started the process, so the difference in mass was converted to energy as described by Einstein’s theory of relativity (e=mc2). The energy is emitted in various forms of light (ultraviolet light, x-rays, visible light, infrared, microwaves and radio waves). The sun also emits energized particles (neutrinos, protons) that make up the solar wind. This energy strikes Earth, where it warms the planet, drives our weather and provides energy for life. We are not harmed by most of the radiation or solar wind because the Earth’s atmosphere protects us. In 1905, Albert Einstein published the famous equation e=mc2. Energy equals mass times the speed of light squared. On the basis of this work done by Francis W. Aston and Jean Baptiste Perrin, Arthur Eddington proposed in 1920 that the Sun could get energy from converting hydrogen nuclei into helium nuclei. Nuclear fusion on Earth has proven to be exceptionally difficult to reproduce. The first artificial fusion reaction occurred when the hydrogen bomb was tested in November 1952. Since the 1950s physicists and engineers have been attempting (using various techniques) to build fusion reactors for the purpose of generating electricity. If successful, mankind will have an inexhaustible source of energy, but the technical challenges facing them are great. By using nuclear fusion as an energy source, scientists are actually recreating a tiny version of the Sun here on Earth. Internal view of the JET tokamak superimposed with an image of a plasma taken with a visible spectrum video camera. To date, the most promising technology is the Tokamak which was proposed in 1951 by Andrei Sakharov and Igor Y. Tamm. The first successful Tokamak was built and tested in Russia in the late 1960s. The Tokamak produces hot plasma, the fourth state of matter and uses powerful magnetic fields to contain the fusion reaction. While there are considerable advantages to nuclear fusion power (such as no radioactive byproducts and cheap and plentiful fuel), so far the energy input needed to cause controlled fusion has been greater than the energy obtained from the reaction. Currently Tokamaks have only been able to create fusion reactions lasting seconds. However, in Cadarache, France one of the largest scientific projects in human history is underway: the ITER large fusion project. ITER is an international project involving many countries from around the world and may one day be able to generate 500 megawatts of energy from just 0.5 grams of matter.